Water-tight chrome plated brass. 1-1/2" diameter chrome plated brass flange with waterproof plastic snap-on cover. 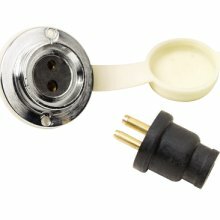 Two pin double contact socket and plug. Plug has protective black plastic boot. Fasten with #4 screws. 3A @ 12V.